But when other 33 KV source feeding other power transformer and other 11KV feeders fails (supply interrupted from 132/33KV substation), the substation operator will not know as there is no indication/alarms. The operator will not know until somebody calls him for non availability of supply in their premises. This will lead to increased interruption time and inconvenience to thousands of consumers. To avoid this situation and to improve customer satisfaction and in turn to improve the revenues of the company, two types of relays have been designed. In this system the current flowing in the metering circuit of the current transformer is sampled and compared with preset value and conditions are detected. 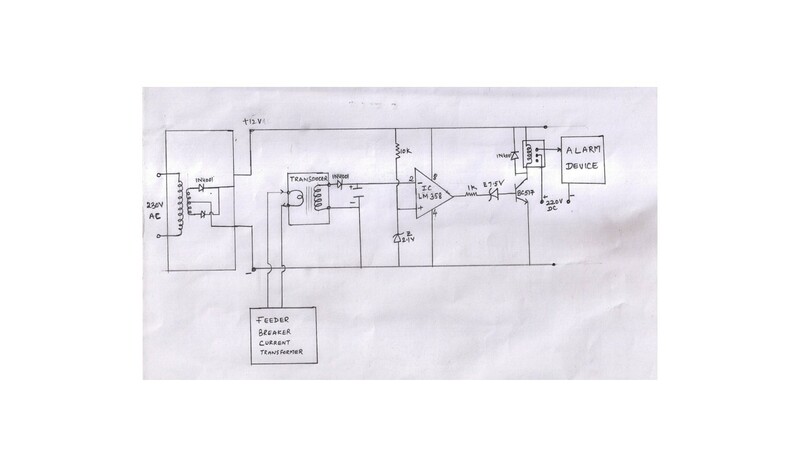 The circuit is built around basic operation amplifier IC, used as comparator. This IC compares the current in the connected network with preset value and gives alarm if found abnormal. This device operates on 230 volts AC as well as 12 volts DC supply. 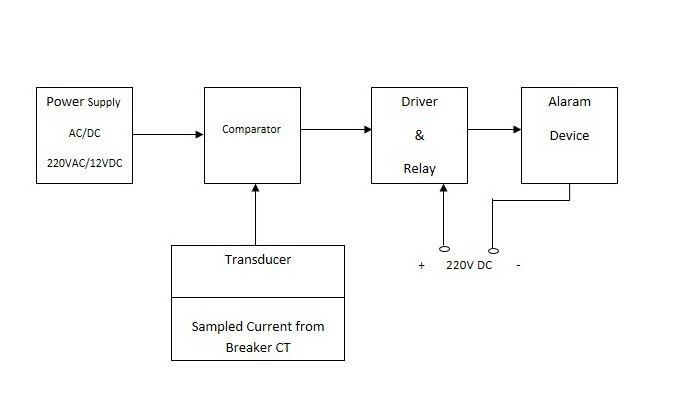 A CT coil is used as a basic transducer which converts current flowing in the connected network to a lower value, and it is converted into proportional voltage. This voltage is further rectified to DC voltage and passed on to comparator IC358 inverting input Pin-2 for comparing with preset DC value at non inverting input Pin-3. After comparing, the IC output will be high or low as per DC voltage at Pin-2. If the voltage at Pin-2 is less than voltage at Pin-3, the output Pin-1 will be high and vice versa. This output will drive the relay with driver transistor BC517. This relay will in turn connect the 220 Volts DC to alarm device which give indication to operator for taking action. This circuit is very simple compared to previously discussed model. 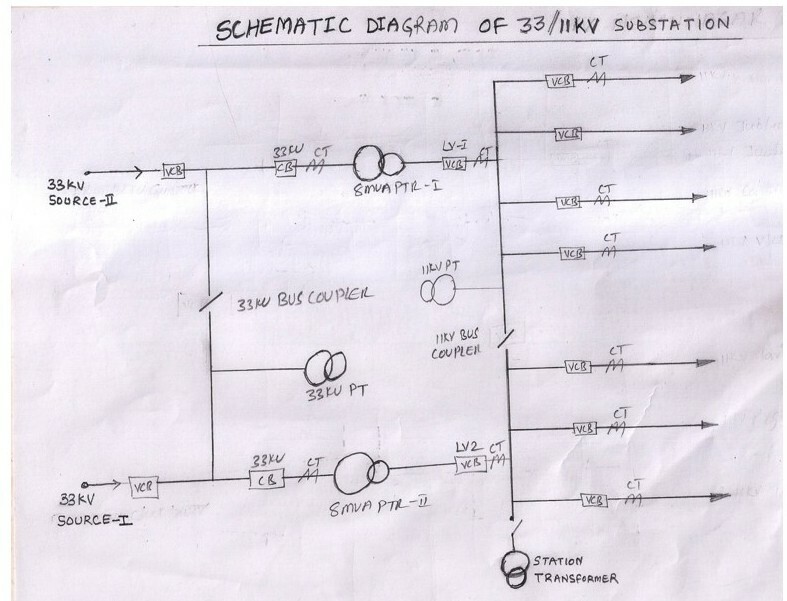 Here the voltage of potential transformer available in the substation, if connected on other side of the station transformer (as discussed above) is utilized as sample voltage. The 110 Volts AC voltage from potential transformer is stepped down, rectified with rectifier diodes and smoothed with capacitor and applied to a DC relay. The relay gets energized if the supply is available and vice versa. The NO or NC contacts of relay are utilized for connecting 220 Volts DC supply to alarm device. The alarm device will alert operator for taking necessary action. These devices are specially designed, to alert the operator when the SECOND incoming source fails, which is not existing in the present system. These two models are successfully functioning at 33/11KV Hussainsagar substation which are designed by me. The alarm device crafted out of innovative methods shows, how closely the substation equipment and its working is monitored. The thought of having an alarm in place, is very much eulogized, since this gadget saves heavy interruptions which may run into hours, if the operator is not alerted. Congratulations, on your thought & achievement. Good thought and congratulation on the achievement . This system will definitely help the SS Operator where there are two or more Incoming supplies in use. so many people are doing first release in CAT-I and then convert it to CAT-II ofter 1 or 2 months by booking case as un-authorised in MATS. in this un-authorised case assessment charges are just 400 to 500 rupees only. but actually for CAT-II we should collect 2850 /- for connection. so they saved around 2200 rupees for consumers. so may connections are released in this way.much amount loss for OUR COMPANY..